The 2008 Windsor Tornado highlights the very real danger twisters present in Colorado. Do you know when to do when one strikes? One fact that may surprise those new to Colorado is that we are actually on the western edge of the infamous Tornado Alley. This large swath of land comprises much of the nation’s midsection and is a unique place as the United States sees more tornadoes than any other place on earth. In fact, tornadoes have been recorded in all 50 states including Alaska and Hawaii. Closer to home, Colorado sees our share of these storms. In fact, one metro area county – Weld County – holds the distinction of being the “tornado capital of the world.” With 252 tornados from 1950-2011, no single county in the nation has had more tornadoes! Adams County is number two in the state and isn’t far behind with 156 over that same period. Granted these numbers are skewed a bit simply due to the sheer size of those counties, but it does serve to highlight the real danger that tornadoes present. Even here in the metro area tornadoes are a real danger. 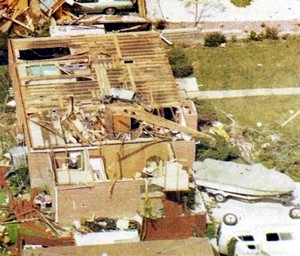 The Thornton area was struck in 1981, one of the worst tornadoes to strike the Denver area in history. At 2:30 p.m. this tornado touched down and by 2:45 p.m., the tornado had hit Thornton City Hall. 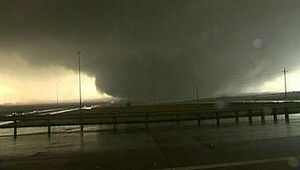 The tornado’s destruction sent 53 injured people to hospitals, 25 homes were destroyed and 239 structures were damaged. One common myth is that tornadoes don’t strike metropolitan areas. This has been disproved many times including here in Colorado in 1981 when an F2 tornado struck Thornton. Image courtesy the City of Thornton archives. The most well known tornado outbreak in the metro area occurred on June 15, 1988. Five tornadoes resulted in seven injuries and damage in excess of $15 million. We all of course also remember in 2008 when the town of Windsor, not far from Denver, was struck with an EF-3 tornado that claimed one life and destroyed and damaged hundreds of buildings. The greatest threat for tornadoes occurs during late spring and early summer when you have a combination of heat and moisture in the lower atmosphere. Here in Colorado, tornadoes are frequent from May through August with June being the most active month. However, there is no hard and fast rule for when tornadoes strike, as Colorado witnessed on March 29, 2007 when Holly, Colorado was struck by an EF-3 tornado with winds of 165 mph. Two women lost their lives as a result of that event and 160 homes were damaged. Colorado ranks 10th in terms of the number of tornadoes with 1,911 events from 1950-2011. One good thing is that our high altitude and drier air do make it harder for the monster supercells that spawn the biggest tornadoes to form. Most of our tornadoes are small and short lived. Further, thanks to the wide open spaces of the eastern half of our state, many strike sparsely populated areas. This is reflected in the fact that we rank 38th for tornado related deaths. A weak cold front that moved in last night coupled with a disturbance coming through today will mix up our weather a bit. Temperatures will cool down but remain above normal and we see just a chance for a PM shower or thunderstorm. The day starts with partly clear skies and similar conditions will be with us into the afternoon after which coverage will increase. Temperatures today will top out in the upper 60s, cooler than yesterday but still a good bit above normal. The afternoon brings a chance for a shower or thunderstorm with the best opportunity coming between about 3:00pm and 6:00pm. Only scattered activity is expected with most action being to our south. Tonight, a light rain shower may be seen before midnight with lows in the low 40s. A very nice looking spring day gets things started for the workweek. We will enjoy a good dose of sun and temperatures well above normal. Mostly sunny skies will above for much of the day with a few mid-level clouds popping up. Temperatures start out cool then will warm to a high in the low 70s, well above the average high for the date of 61 degrees. Tonight, we will have partly cloudy skies with lows in the low 40s. The 2008 Windsor tornado highlighted just how dangerous weather in Colorado can be. Are you and your family prepared? Do you know what the watches and warnings all mean? We’ve all seen TV or Internet news of a weather related watch or warning being issued. But, how many really know what they mean? There is a pretty big difference between the two and it is important to be aware just what it means to you so you can take the appropriate precautions. Dozens of weather related fatalities occur every year in Colorado, many simply out of ignorance. Taking the time to be aware of the conditions around you and taking appropriate action will keep you from becoming a statistic. Naturally you can get information on current advisories from television as local stations usually do a good job of “crawling” them on the screen when they are issued. This works well if you have a TV available but if not, the radio would be a secondary source. The Internet and the National Weather Service’s website are a great one when at a computer. The problem with relying on news media or the Internet is that their ability to warn you of a developing weather situation is dependent on your monitoring them. Severe weather can strike without little warning. How will you know if severe weather is about to strike if you don’t have the TV or radio on? For just about anywhere, a special radio that picks up the NOAA’s All Hazard Radio broadcasts is the way to go and provides information from the source. Oftentimes simply called a weather radio, we highly recommend every household have one of these. What does a weather radio sound like? Click here to listen in live. These radios are relatively inexpensive and allow you to be immediately notified of official National Weather Service warnings, watches, and forecasts as well as other hazard information like earthquakes, avalanches, chemical spills, and even AMBER alerts. In fact, with these radios, you will be notified at the exact same time the news media is made aware giving you a head start on preparing for a developing situation. To learn more about these devices and what you should look for when buying one, click here. Many people now have smartphones that allow for downloadable apps and weather-related ones are among the most popular. All of these applications have a number of weather related features in common. All provide current conditions for either the location the user is in now or for saved locations and all provide some sort of radar. Most can be configured to sound an alert when the National Weather Service issues a watch or warning. While they are no substitue for a weather radio, these apps provide you with immediate notification no matter where you are at. For a look at some of these weather apps and their features, click here. In 1981 a tornado ripped through Thornton and caused major damage. Last year, funnel clouds were spotted across much of the area. Image courtesy City of Thornton archives. As is customary, Colorado Governor John Hickenlooper has declared this coming week Severe Weather Awareness Week. This is an opportunity for the public to get reacquainted with the dangers severe weather presents in Colorado. Tornadoes, lightning, hail, severe wind and flooding are very real hazards that Coloradans face every year during severe weather season. It is important that you know what to do to protect you and your family. 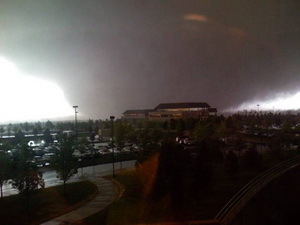 Just nine years ago in what was Denver’s weather story of the year, we suffered through a period of unusually severe weather including a tornado that ripped through the Southlands Mall. Ten years ago on May 22nd an EF3 tornado raced north through Weld and Larimer counties resulting in one fatality near Windsor and causing several injuries and destroyed or heavily damaged hundreds of homes. And of course in 1981 Thornton was the site of the worst tornado to ever strike the Denver metro area. Tornadoes may get all the press but other severe weather can be damaging and deadly. Just four years ago, late summer flooding caused millions of dollars of damage across northeastern Colorado. It was 40 years ago that thunderstorms brought a raging torrent of water down the Big Thompson and caused one of Colorado’s worst natural disasters. Six years ago hail struck the Thornton area causing damage to homes and vehicles. Do you need to jog your memory about the Windsor tornado? Watch the amazing video below. In conjunction with the National Weather Service’s statements on Severe Weather Awareness Week, ThorntonWeather.com will be publishing our Severe Weather 101 series. Each day this week a weather hazard will be discussed in depth and we will outline protective measures you can take to keep yourself and your family safe. Please be sure to check back every day to read these important message. Springtime in Colorado can certainly be pleasant but it can also bring an amazing array of interesting weather. Our look back at this week contains everything from snowstorms and damaging wind to severe thunderstorms with hail and tornadoes. In 1945…heavy snowfall totaled 9.8 inches in downtown Denver. Most of the snow…4.8 inches…fell on the 14th. Snow fell for a total of 53 consecutive hours. This was the second big snow in less than 2 weeks. The air mass was very cold for April. High temperatures of 21 degrees on the 14th and 32 degrees on the 15th were record low maximums for those dates. In 1874…light snow developed around daybreak and became moderate to heavy by mid-morning and continued into the early evening. While most of the snow melted as it fell… Total precipitation from the melted snow was 0.95 inch. This would make the estimated snowfall nearly 10 inches. In 1963…high winds were widespread across metro Denver. West winds gusted to 63 mph in Denver at Stapleton Airport with sustained winds of 35 mph and gusts to 70 mph in downtown Boulder. The winds caused extensive damage to buildings and other property. Visibility was briefly reduced to 1/2 mile in blowing dust at Stapleton Airport. In 1998…another spring storm brought heavy snow to the foothills. Thirty to 40 vehicles were involved in accidents along I-70 near Georgetown. The combination of poor visibilities…slick roads…and careless drivers led to the multi-car pileups. Only minor injuries were reported. The accidents forced the closure of all of I-70’s eastbound lanes. Snowfall totals included 12 inches at Genesee and 10 inches at Aspen Springs…Chief Hosa…Georgetown…near Morrison…and on North Turkey Creek. Only 0.1 inch of snow fell at the site of the former Stapleton International Airport. East winds gusted to 30 mph at Denver International Airport. In 2002…unseasonable warm weather resulted in two records being broken. The high temperature of 84 degrees was a record maximum for the date. The low temperature of 57 degrees was a record high minimum for the date. In 1900…heavy rainfall totaled 2.33 inches. A trace of snow was mixed with the rain at times. In 1950…thunderstorms and heavy rain behind a cold front produced 2.13 inches of rain in 24 hours at Stapleton Airport. In 2003…a fast moving pacific storm system moved across Colorado allowing strong winds to develop over the eastern foothills and metro Denver. Northwest winds gusted to 59 mph at Denver International Airport late in the evening of the 15th. In 2016…1.22 inches of precipitation was measured at Denver International Airport which was the greatest daily amount for the month. In 1922…heavy snowfall totaled 9.0 inches in downtown Denver. Most of the snow…6.0 inches…fell on the 16th. This was the third major snow storm in a week. Northwest winds were sustained to 43 mph with gusts to 47 mph on the 15th. In 2016…a powerful spring snowstorm brought heavy…wet snow to areas in and near the Front Range Foothills and Palmer Divide. Storm totals generally ranged from 2 to 4 feet in the foothills with 1 to 2 feet in the mountain west of Denver and along the Palmer Divide. Along the I-25 Corridor storm totals ranged from 6 to 20 inches…with highest amounts across the western and southern suburbs. Some of those totals included: 16 inches in Aurora and Superior; 15 inches at the National Weather Service Office in Boulder; 14.5 inches in Broomfield; 13.5 inches in Westminster; officially 12.1 inches at Denver International Airport; 12 inches in Louisville; 11.5 inches in Arvada; 11 inches near Englewood; 10.5 inches near Wheat Ridge. At Denver International Airport…there were 852 flight cancellations… most of which occurred on the 16th. The heavy wet snowfall broke trees limbs and caused scattered power outages. Over five thousand customers were without power on the 16th…and over two thousand on the 17th. Xcel Energy brought in extra crews from surrounding states to help restore power and minimize outage times through the storm. Numerous but mostly temporary road closures from 1 to 5 hours occurred throughout the storm. This included portions of I-70 east and west of Denver…Highway 103 from Idaho Springs to Evergreen and Highway 119 through Black Hawk. In 1960…a wind storm struck all of metro Denver. Estimated wind gusts up to 80 mph were registered in Boulder. At Stapleton Airport sustained west-northwest winds over 50 mph with gusts as high as 70 mph produced some blowing dust. The high winds damaged buildings…power and telephone lines…and signs. Five people were injured in metro Denver as a result of the wind storm. Blowing dust reduced visibility at times. The winds were strong and gusty for most of the day. A bit of a mixed bag of weather for the three day period. Unsettled, cool conditions will be with us Friday and Saturday then Sunday rebounds and will offer the nicest day of the period. For today, mostly cloudy skies will be above throughout the day. Highs will only be around 40 degrees. By mid to late afternoon, scattered, light showers will develop, initially as rain then changing to snow. Light accumulations may be seen overnight. Cloudy skies will be above tonight with lows in the mid-20s. Saturday morning may continue to see some light precipitation in the form of a wintry mix of drizzle and snow. That should end by about noon then we will dry out. Mostly cloudy skies will be above with highs in the mid-40s. Overnight Saturday into Sunday morning, mostly cloudy skies will be above initially then will begin to clear after midnight. Lows will be around 30 degrees. Sunday finally sees the weather straighten out. Mostly sunny skies will be above with highs in the low to mid-60s. Thornton hasn’t had any truly big time snows this year but we have managed a number of respectable ones and that shows in our seasonal snow totals. As of today, Thornton has received 49.1 inches of snow for the season. That is just slightly below our running 13 year seasonal average of 53.1 inches. As for Denver, officially, the Mile High City has recorded 43.2 inches thus far this season as measured at DIA. The all-time seasonal average snowfall for Denver is 57.1 inches (55.3 inches 30 year average) so there is still ground to make up there to get near average. With half of April and all of May to go, there’s still plenty of time to add to those numbers. In case you were wondering… The average date of Denver’s last snowfall is April 27th. The latest? June 12, 1947 when a trace was recorded. The latest measurable snowfall was 0.4 inches on June 1, 2919. A nice snowstorm yesterday but certainly not on par with the previous one. We did receive 4.8 inches of snow on the grass while much of what hit the streets melted. Today, we dry out but temps remain cold and we will see some breezy winds. Cloudy skies start us off and the balance of the day will be mostly cloudy to cloudy. Snow should be done by about 7:00am or soon after. Temperatures will top out around the 40 degree mark. Winds will be a bit breezy from late morning into the late afternoon so it will feel colder than that. We may see a few flakes of snow in the late afternoon and early evening but no accumulation is expected. While the calendar may say spring, wintry weather can and often does appear and many times it has a big impact. We clearly see this in our look back at this week in weather history where wind and snow make many appearances. In 1909…post-frontal rain changed to heavy snow on the afternoon of the 4th and continued through mid-morning of the 7th. Total snowfall was 18.7 inches…but most of the snow…14.0 inches…fell from 6:00 pm on the 4th to 6:00 pm on the 5th. North to northeast winds were sustained to 32 mph on the 4th and to 30 mph on the 7th. Total precipitation from the storm was 1.78 inches. In 1916…rain changed to snow behind a cold front on the 5th and totaled 4.5 inches in the city. A thunderstorm produced snow on the 6th. North winds were sustained to 35 mph with gusts to 38 mph on the 7th. In 1872…rain changed to snow overnight. Snow with high north winds continued all day on the 7th. Precipitation (rain and melted snow) totaled 0.50 inch. Due to problems on the lines…the morning weather report was not sent by telegraph until 3:10 pm and the midnight report was not sent at all. In 1957…heavy snowfall totaled 6.6 inches at Stapleton Airport where north winds gusted to 46 mph. This was the second heavy snow event in less than 4 days. In 1969…winds gusting as high as 50 to 60 mph caused only light damage along the eastern foothills. The strong winds contributed to the spread of a forest fire near Boulder. Sustained winds of 25 mph with gusts to 53 mph were recorded in Boulder. Southwest winds gusted to 38 mph on the 6th and 44 mph on the 7th at Stapleton International Airport. In 1980…high winds howled along the foothills each day. A wind gust to 72 mph was recorded in Lakewood. The strong winds blew a camper top off a pickup truck in Denver. At Stapleton International Airport…west winds gusted to 41 mph on both days. In 1998…a spring storm brought a mix of snow and thunder to metro Denver…the foothills…and Palmer Divide. Conifer and Elizabeth both measured 4 inches of new snow. On the 6th…only 0.1 inch of snow fell at the site of the former Stapleton International Airport where thunder was heard on both days. Precipitation totaled 0.60 inch at Denver International Airport where west winds gusted to 43 mph on the 6th. In 1906…north winds were sustained to 48 mph in the city. In 1958…strong south winds blew most of the day across metro Denver. A wind gust to 52 mph was recorded at Stapleton Airport. In 1962…strong gusty winds associated with a cold front caused considerable damage to power lines…signs… Buildings…and trees across metro Denver. In Boulder…an outdoor movie screen…valued at 10 thousand dollars…was wrecked. In Denver…a youth was injured when a car was blown off a jack…pinning him underneath. Wind gusts to 61 mph were recorded at Stapleton Airport where visibility was reduced to 1/2 mile in blowing dust. Snowfall totaled 2.6 inches at Stapleton Airport. In 1971…wind gusts to 69 mph were recorded at the National Bureau of Standards in Boulder. In downtown Boulder…winds peaked to 54 mph. West winds gusted to 31 mph at Stapleton International Airport. 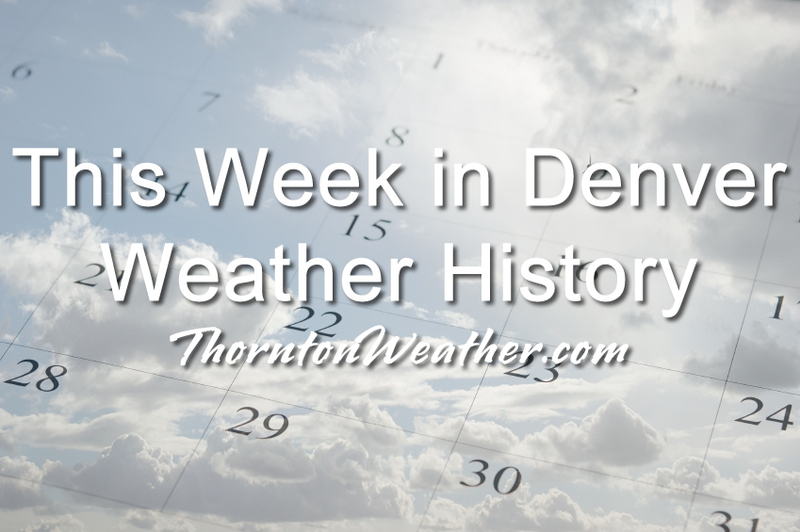 In 1989…high winds occurred in the foothills west of Denver. At Nederland west of Boulder…high winds damaged roofs… Toppled trees…and caused power outages. Winds estimated as high as 90 mph in Georgetown overturned campers and even semi-trailers on I-70 and damaged road signs. Three trailer homes were blown off their foundations and a 50-foot tree toppled onto the roof of a home…causing considerable damage. Winds reached 94 mph at Rollinsville southwest of Boulder. Northwest winds gusted to 43 mph at Stapleton International Airport.